Every January, councillors on the central Maldivian island of Baa Atoll Goidhoo switch on the island’s water desalination plant in preparation for the dry season. In doing so, the council hopes to scrape through the blistering heat of the four-month-long northeastern monsoon without having to rely on others to provide its 700 inhabitants with clean water. However, this year the council was not able to fire up the plant because of severe budget constraints and maintenance issues. “The government is not giving us money to repair it. How can we fix and run the plant while we can’t afford its electricity bill?” asked council president Mohamed Amir. “The households have now run out of water,” Amir said. Amir had no choice but to notify the National Disaster Management Centre of severe water shortages, becoming one of over 69 islands to have reported droughts this year alone. Since its inception in 2004 after the Indian Ocean tsunami, the centre has been providing water to about 80 of the Maldives’ 200 inhabited islands each dry season for the last ten years, says Hisaan Hassan, a spokesman for the centre. The tsunami severely contaminated groundwater in several islands, forcing inhabitants to look up to the skies for rainwater instead. When a fire in the capital, Malé, cut off water supplies last year, the crisis drew global media attention and prompted the public to ask how prepared the government is for an emergency water cutoff. However, islanders who face the same problem every year remain hopeless, with no permanent solution in sight. Environmental consultant and water expert Fathimath Saeedha says that the government needs to immediately come up with strategic, yet island-specific solutions. Unlike in Malé, where the groundwater is heavily polluted due to over-consumption, islanders in atolls used to rely on groundwater for consumption. However, thanks to a rapid population increase and the arrival of appliances such as washing machines, groundwater consumption in the islands has increased above the rate at which groundwater is naturally replenished, said the environment ministry. In addition, the ministry points the finger towards the 2004 Indian Ocean tsunami, which heavily polluted many islands’ fresh water table, lying one to 1.5 meters below the soil surface. The tsunami killed at least 82 people in the Maldives and caused $470m of damage. However, a United Nations Environmental Programme tsunami impact study in 2005 estimated that only 39 islands’ groundwater had been suitable for drinking even before the tsunami. Water expert Saeedha also pointed out that poorly constructed septic tanks in the islands have contributed to water contamination. “People built septic tanks on their own, which led to domestic waste leaking into the water table,” said Saeedha. With the groundwater contaminated, inhabitants then had to rely on rainwater for consumption. In 2005, the government provided islands with large numbers of storage tanks to store rainwater. However, with low average rainfall during the dry season, numerous islands are left in a drought every year, forced to rely on the disaster centre for drinking water. Umar Fikry, another spokesman for the disaster centre, says that it has urged all island councils to inform the centre of water shortages in advance. “We are prepared and ready for the water shortages every year,” Umar said. He says that islands usually report water shortages to the centre when they are down to one month’s supply. However, the National Disaster Management Centre is among those questioning whether the centre should be called upon to deal with shortages every year. “We spend an average of MVR 5 million (US$ 330,000) on delivering water to the islands [each year]. The problem cannot be solved by the disaster centre alone,” said the centre’s Hisan Hassan. Hisan believes it is time for everyone from the environment ministry to island councils and the general public to get involved in looking for a permanent solution. Individuals have to keep in mind this happens every year and focus on better water usage, while councils should work on getting better storage systems in place for the dry season, said Hisaan. The Environment Ministry meanwhile is running a water programme aiming to create an integrated network of island water storage containers in 30 strategic locations. Three of the island storage locations have been completed, while seven are undergoing construction. Furthermore the ministry has secured finance to build 14 new desalination plants, it said. With the disaster centre called upon to provide large quantities of water, some islands have criticised the quality of the water that arrives. “People did not use the water because there was a pungent smell in it. We should be provided with good quality water,” complained Baa Atoll Dharavandhoo council president Hussein Nazim. Dharavandhoo is home to one of the busiest regional airports in the country, bringing in tourists from the capital to the atoll’s eight resorts. 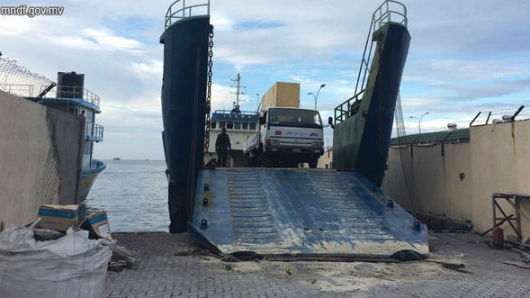 Nazim said that he was told that the water arrived from nearby Dhuvaafaru in the storage area of a fishing boat. Some islanders had to resort to pumping water from households lucky enough to have clean well water, he added. A resident of nearby Goidhoo said that it is “immensely difficult” to fulfill essential water needs during the dry season. “Every house has a water tank which runs out during the dry season. Now we have to go to the water plant on the beach through the boiling sun,” she complained. Water expert Faathimath Saeedha says there is no one overall solution to the annual water crisis, with different areas instead needing a “tailor-made solution”. It is important for the government to come up with a strategic plan to address the root cause of the issues for each island, she said. Back in Goidhoo, council president Amir has been able to fire up the desalination plant with a “temporary fix which will last the current dry season”. He believes that the situation will repeat itself again next year, with the councillors forced to resort to the barely functioning water plant, hoping for the best. “On December 5, the Indian Railway Catering and Tourism Corporation (IRCTC) received a phone call from the Union external affairs ministry, routed through the railway ministry,” recalls Jyoti Mukul for India’s Business Standard. “It was not a usual communication but a direction to pull out something as basic as drinking water to meet a diplomatic call. A day earlier, the Maldivian capital of Male had experienced a crisis. Its only desalination plant, which supplies drinking water to citizens after treating sea water, had caught fire. It, indeed, was a disaster for the island nation; India offered help and so did China and Sri Lanka. Since the sea route would take at least four days, the quickest relief was to air-lift drinking water from India and take it to Male. Malé Water and Sewerage Company’s (MWSC) board has dismissed Managing Director Ahmed Umar from his post, reports local media. Speaking to Haveeru, Chairman of the Privatisation Board Mohamed Nizaar said that the board decided to terminate Umar and said an individual to replace Umar has been suggested to the government. Haveeru reported that Umar was appointed to the post of the Public Company by President Abdulla Yameen on a Jumhooree Party slot in the coalition government. MWSC and its management were severely criticised for lack of response after the capital’s 130,000 residents were left without running water for nine days following a fire at the MWSC desalination plant in December. After a government request for assistance, India, China, and Bangladesh airlifted bottled water, while both India and China sent in ships equipped with desalination plants to produce water for the capital. Normal operations resumed at the Malé water plant on December 13. 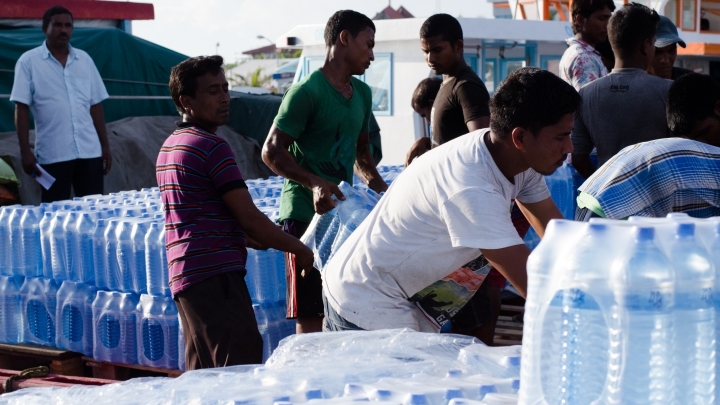 Distribution of free water will stop today in the capital Malé, says the Maldives National Defence Force (MNDF), as the water crisis nears an end. After a fire in the Malé Water and Sewerage Company (MWSC) on December 4 left the capital’s 130,000 inhabitants without running water, 24 hour service was resumed to homes yesterday. An MNDF spokesman confirmed to Minivan News today that the mobile units had ceased operation, and that distribution of bottled water from 10 designated points in the city would stop today. The Maldives Red Crescent – which has played a key role in relief efforts – has also confirmed that its operations have shut down. “We have closed down our operations centre as things are more or less back to normal,” explained Senior Programme Officer Fathimath Himya. Minister of Defence Colonel (retired) Mohamed Nazim – who leads the president’s water crisis task force – told the media on Thursday night that full services would be resumed for three days in order to test the repairs. “The water treatment plant is functioning on a temporary setup,” Haveeru reported Nazim as saying. “But we must ask you to not stress the water supply and manage by making some adjustments”. Custom built panel boards arrive in the Maldives from Singapore on Wednesday via a Sri Lankan Air Force flight. Sri Lanka has been among a number of international donors who have provided bottled water and desalination facilities over the past 8 days – most notably India which was first to respond, sending military aircraft with fresh supplies within 24 hours of the fire. 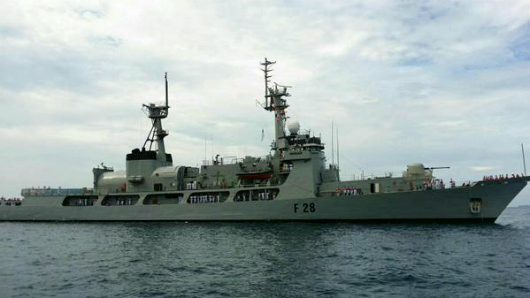 The Bangladeshi naval ship Samudra Joy became the third vessel to arrive in Malé on Thursday (December 11), joining the Indian and Chinese ships already docked near Malé’s main port. While Nazim had announced on Wednesday (December 10) that free water would no longer be distribute as stocks returned to local shops, long lines continued to be seen around the capital on Friday evening. The crisis has raised questions regarding the city’s preparedness for such an instance, although President Abdulla Yameen has described the situation as unforeseeable. During the crisis, Yameen’s task force revealed it was to seeking US$20million in donations to the ‘Malé water crisis management fund’. 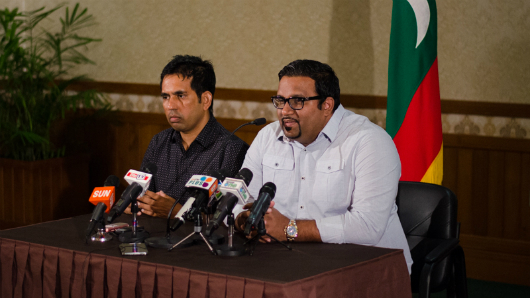 After the opposition and civil society groups expressed concerns over the lack of detail regarding the fund, Nazim explained on Wednesday that it would cover the uninsured costs of relief efforts as well as the construction of the 20,000 ton water reserve. The President’s Office explained earlier this week that MWSC plants produce 20,000 tonnes of water per day at full capacity, while the population of Malé consumed around 14,000 tonnes per day. The government has revealed that private donors have contributed US$5.5million to the fund so far, pledging to disclose full details of fund. China is reported to have donated to the fund, as well as private donors from Saudi Arabia and from within the Maldives. Both the UN in Maldives and the Human Rights Commission of Maldives have commended the government’s response to the situation, though the opposition has called for a full inquiry into the causes of the crisis. President Abdulla Yameen’s administration has scaled down water relief efforts today by ending the distribution of bottled water to residents of capital Malé. “We decided to stop the bottled water distribution because there is no shortage of drinking water at the moment. There is also enough water at corner shops for purchase,” Minister of Defense Colonel (retired) Mohamed Nazim said at a press conference last night. The government had set up water distribution centers after a fire at Malé Water and Sewerage Company (MWSC) on December 4 gutted the sole desalination plant in Malé, leaving 130,000 people without drinking and running water. The opposition Maldivian Democratic Party (MDP) condemned the government’s decision with party Chairperson Ali Waheed saying that the decision will lead to further hardship and claimed the Maldives is currently seeing its worst days since the 1970s. A Bangladeshi navy ship, the BNS Samudra Joy, arrived in Malé today with 100 tonnes of bottled water and five reverse osmosis plants, the Foreign Ministry has said. Meanwhile, custom built panels to replace the damaged panel boards connecting electricity generators and desalination plants at MWSC arrived in Malé from Singapore today. MWSC has now started releasing water once in the morning and once at night. Water was available for four hours this morning and will be available from 7:30 pm – 12:00 am tonight. Nazim, who also heads the water crisis task force, said that funds would mainly be used to recover costs which are not covered by insurance, the construction of the 20,000 ton water reserve and to cover the cost of relief operations. Individuals and corporations who contributed to the relief effort will all be reimbursed, he said. The fund’s establishment has garnered criticism from the opposition and civil society groups, who have demanded transparency in the fund’s utilization. “Information about the fund would be released in a very transparent manner. I urge the public to refrain from politicizing the fund.” he added. Private donors have contributed US$5.5million to the fund so far. Protests demanding free water continued in Malé last night, but were disrupted for the third time by a group of seven young men. Minivan news observed six to seven young men who were hiding within the protesters jump on a truck and start vandalizing the generator powering the sound system. One attacker lifted up the generator and threw it on the ground. Police immediately moved in and arrested the attackers. Minivan news saw little to no resistance from the attackers during the arrest. Several eyewitnesses later told Minivan news that the attackers were praising President Yameen as they waited for a police vehicle to take them to the police head quarters. “President Yameen is the best thing to have happened to the nation,” one of the attackers was reported as saying. Another eyewitness told Minivan News that he heard one Special Operations (SO) police officer insulting Former President Mohamed Nasheed while stating those arrested would be released the next day. A police media official confirmed to minivan news that seven men were arrested last night in relation to the attacks at the protest. A similar incident occurred on the previous night when three young men attacked the protest armed with box cutters. On Wednesday, Mirihi Island resort has donated a temporary desalination plant capable of producing 100 tonnes of water to the Indhira Gandhi Memorial Hospital. The MNDF has also started distributing disposable cups, plates and cutlery to cafés in Malé. The Human Rights Commission of Maldives (HRCM) commended the government’s response and relief efforts during the ongoing Malé water crisis in a statement issued yesterday on the occasion of International Human Rights Day. The efforts of various government institutions – under the supervision of President Abdulla Yameen – to provide water to residents of the capital were “praiseworthy,” HRCM Chair Mariyam Azra said. The HRCM noted that arrangements were made to prioritise persons with special needs, pregnant women, the elderly, and children. The commission advised taking the human rights of disadvantaged persons into account when formulating government policies, structures, and plans. Meanwhile, among the commission’s achievements during the past year were conducting a national inquiry into the rights of persons with disabilities and finalising plans to open a regional office in the south. The People’s Majlis today approved the record MVR24.3 billion (US$1.5 billion) state budget for 2015 submitted by the government without significant changes to either spending plans or revenue forecasts. None of the 19 amendments submitted by opposition Maldivian Democratic Party (MDP) MPs and Jumhooree Party (JP) MPs to revise the budget passed as pro-government MPs voted against all the proposals. The ruling Progressive Party of Maldives (PPM) along with coalition partner Maldives Development Alliance (MDA) controls a combined 48 seats in the 85-member house. The budget passed with 60 votes in favour and 19 against. The MDP parliamentary group had issued a three-line whip for its MPs to vote against the budget if none of the proposed revisions are passed. All JP MPs, however, voted to approve the budget. While the budget review committee completed its review process without significant revisions, pro-government MPs recommended several constitutional amendments to reduce recurrent expenditure. During the budget debate last month, opposition MPs criticised higher taxes, deficit spending and alleged discrimination in the allocation of funds, whilst pro-government MPs praised planned capital investments and contended that the budget was balanced. In his budget speech, Finance Minister Abdulla Jihad noted that recurrent expenditure in 2015 is expected to be MVR15.8 billion (US$1 billion) or 65 percent of the budget while the forecast for government income or revenue is MVR21.5 billion (US$1.3 billion). Capital expenditure meanwhile accounts for 30 percent of the budget, Jihad said, which includes MVR6.3 billion (US$408 million) for the Public Sector Investment Programme (PSIP). Jihad noted that MVR3.4 billion (US$220 million) was anticipated from new revenue raising measures, which includes revisions of import duty rates from July onward, the introduction of a ‘green tax’, acquisition fees from investments to special economic zones, income from the home ownership programme, and leasing 10 islands for resort development. The government has since decided to reduce the green tax from the initially proposed US$10 per day to US$6 per day and exempt guest houses from the tax. Additionally, the cabinet’s economic council yesterday decided not to impose a planned 10 percent import duty on staple foodstuff. However, in its professional opinion on the budget, the Maldives Monetary Authority (MMA) advised against making ad hoc changes to policies that could affect projected revenue and expenditure. “If policies are changed the budget deficit would increase and become difficult to finance,” the central bank cautioned. The MMA also advised against launching infrastructure projects without securing financing. The IMF also recommended addressing the fiscal deficit by reducing public expenditure and reigning in public debt. During the final debate at today’s sitting of parliament on the report compiled by the budget committee following its review, MPs suggested allocating funds in the 2015 state budget to ensure a permanent solution to the ongoing water crisis in the capital. While opposition MDP MP Ibrahim Mohamed Solih recommended returning the budget to the committee for revisions, several MPs stressed the importance of establishing a backup mechanism to supply water. MDP MP Ibrahim Mohamed Didi contended that the crisis could have been averted if the fire and rescue service of the Maldives National Defence Force (MNDF) properly carried out its responsibilities. The MNDF could have conducted a ‘fire audit’ of the Malé Water and Sewerage Company (MWSC) at least once a month in the interest of national security, the retired brigadier general said. A group carrying box cutters on Tuesday attacked protestors demanding free water in Malé. Minivan News observed five young men run into the a group of protestors at the junction of Sosun Magu and Medhuziyarai Magu at 10:00 pm, jump onto a truck carrying speakers and vandalize the generator and speakers system. The protesters were calling on the government to provide free water and reverse its decision to only deduct 30 percent from water bills as Malé’s water crisis enters it’s seventh day. After vandalizing the speaker system, the attackers ran into the crowd attacking everyone in their path. An elderly woman was punched and thrown to the ground and an elderly man was hit in the face. He suffered a cut to the head. The woman was immediately taken to the Maldives Red Crescent water crisis headquarters at Majeeedhihyaa School for immediate treatment. She was later transferred to ADK Hospital along with the elderly man for further treatment. Police officers and some protesters chased the attackers. Police arrested two, while angry protesters caught one more and beat him up severely. The police had to carry the attacker away. A police media official told Minivan News the three arrested last night are all under eighteen. Two have since been released. A police officer also sustained injuries to his mouth and nose as he attempted to arrest the attackers. Opposition Maldivian Democratic Party (MDP) Youth Wing President and senior organizer of the protests, Mohamed Azmeel, said between six and seven gangsters armed with box cutter blades initiated the attack. Minivan News saw the blades on the street after the police arrested three of the attackers. Gangsters also vandalized placards used in the free water protest on the previous night (Decemeber 8). Azmeel said the rally will continue tonight. Meanwhile, gang involvement has been speculated behind the torching of the MDP main office on September 29 using molotov cocktails after it was also vandalized on September 24. Early October, an MDP office in Addu City was torched while masked men wielding wooden planks and batons attacked a party rally. 16 people were arrested that night however the police released nine of them the following day. Transparency Maldives has called on the government to display more transparency in order to avoid “economic and political repercussions stemming from the water crisis”. “The Government must publicly provide a breakdown of the estimated US$20 million (more than MVR300 million) needed to overcome the crisis, and how the government intends to spend it,” read a press release from the anti-corruption NGO. Transparency’s statement follows the announcement this week that the government is seeking donations in order to meet the costs of the fire that crippled Malé’s sole desalination plant on December 4. “Furthermore, the decision to seek donations from the public raises questions given that MWSC is a private, profit-making corporation with 80 per cent government shares,” said Transparency. Minister of Tourism Ahmed Adeeb said today that the fund – which has already received support from both foreign and domestic donors – was not intended for the MWSC, but would be utilised by the government. The opposition Maldivian Democratic Party (MDP) has also criticised the fund, stating that the government should only be able to demand US$20 million after they have decided how it is going to be spent. 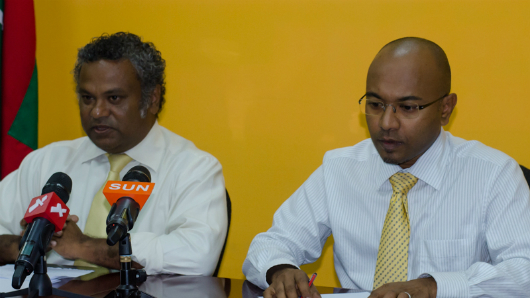 “The MDP along with the people of the Maldives demands answers from the government regarding the US$ 20 million fund,” said party Vice Chairperson Ali Niyaz at a press conference today. “Where is the money going to go to? Why have not seen a breakdown on how the money is going to be spent? Will this be a new ring in the chain of corruption of the government?” he asked. Additionally, party lawyer Hassan Latheef expressed concern that unnamed donors were giving large amounts of money to the fund. Transparency has also called for an independent technical investigation to be conducted, and results to be made public before effective and preventative mechanisms are put in place. “The investigation must scrutinise MWSC’s risk mitigation policy and asset management plan,” said the NGO. With 130,000 citizens of the capital left without water, the government has said it could take up to two weeks to fully repair the extensive damage. President Abdulla Yameen has said that there could have been no back up plan for a “disaster of this magnitude”. Former President and opposition leader Mohamed Nasheed has also called for an inquiry into the fire, suggesting that the Danish government previously recommended keeping 21 days of reserves in the capital. Transparency noted that the crisis had demonstrated “the interminable relationship between good governance and citizens’ right to essential human needs,” calling for greater regulation of state-owned enterprises. MDP lawyer Latheef also criticised what he perceived to be the government’s attempts to pass the constitutional responsibility for water provision to the MWSC.